Our Abpromise guarantee covers the use of ab7460 in the following tested applications. No reaction was observed against anti-Protein A.
Reconstitute product with 1ml of deionized water. Protein G is a bacterial protein derived from the cell wall of certain strains of b-hemolytic Streptococcci. It binds with high affinity to the Fc portion of various classes and subclasses of immunoglobulins from a variety of species. Protein G binds to all IgG subclasses from human, mouse and rat species. It also binds to total IgG from guinea pig, rabbit, goat, cow, sheep, and horse. Protein G binds preferentially to the Fc portion of IgG, but can also bind to the Fab region, making it useful for purification of F(ab') fragments of IgG. Due to it's affinity for the Fc region of many mammalian immunoglobulins, protein G is considered a universal reagent in biochemistry and immunology. Western blot - Recombinant Protein G (HRP) (ab7460)Image courtesy of an anonymous Abreview. Used for detection of primary antibody in WB after IP with the same antibody. 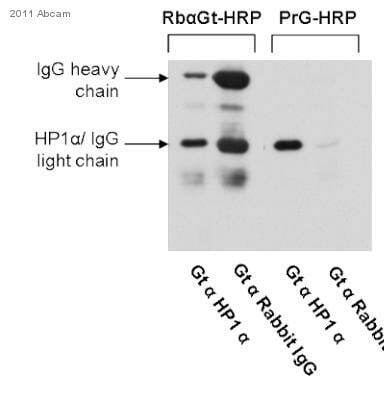 In this case, IP was with goat anti HP1-alpha ab77256 on Protein G beads, and detection was with goat anti HP1-alpha ab77256, and Protein G HRP ab7460. Detection was very specific, and eliminated heavy and light chains of denatured antibodies. Dot Blot analysis of ab7460 Protein G protein (HRP). Review text: Used for detection of primary antibody in WB after IP with the same antibody. In this case, IP was with goat anti HP1-alpha on Protein G beads, and detection was with goat anti HP1-alpha, and Protein G HRP. Detection was very specific, and eliminated heavy and light chains of denatured antibodies.